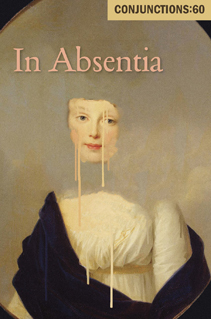 New Fiction in Conjunctions:60, In Absentia! One of my fictions, “Suspension as a Unit of Experience; or, What She Remembered of the Vanishing Lines,” has just been published in Conjunctions:60, In Absentia. Happy to have some of my fiction alongside work by Joyce Carol Oates, Robert Coover, Brian Evenson, Robert Olen Butler, Miranda Mellis, Joanna Ruocco, Stephen O’Connor, J. W. McCormack, Gabriel Blackwell, Matt Bell, Benjamin Hale, Kim Chinquee, Julia Elliott, Carole Maso, Charles Bernstein, Robert Walser, and others. Thanks, Bradford Morrow and everyone at Conjunctions!